Solar Water Heater . . . Although commercial solar water heaters are available, more and more people want to know exactly how to make one for their own homes. Today, heating water with solar energy is making a comeback. Today's systems tend to be less expensive and more reliable. Solar water heaters are used for domestic hot water, pool heating and space heating needs, and are often used in conjunction with a supplemental heat source, or in addition to your regular electric or gas water heater. Solar water systems are designed using two basic concepts, Passive and Active. They are typically made up of collectors, storage tanks, and, depending on the system, electric pumps. Passive solar water heaters require no mechanical devices, and only one moving part . . . the sun. They are easy to build, install and use. They operate entirely on thermodynamics by design. When properly designed, passive solar water heater systems are completely automatic and are often left in operation year-round. They are cheaper to run and generally more maintenance free than active systems, however, they tend to be less efficient. 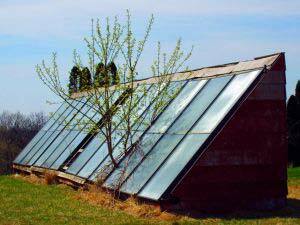 There are two types of passive solar water heating systems. The Integral Passive Solar Water Heater(IPSWH) sometimes called the Integral Collector/Storage(ICS)system, and the Thermosyphon system. In both systems, overheating pop-off valves, and backup water heaters are needed. Both systems also must consider freezing and drain down solutions for colder climates. IPSWH systems work best in non-freeze locations, and are occasionally referred to as breadboxes, or batchers. They are generally systems that collect and store hot water at the same time. Most often they are used to pre-heat the water, but occasionally they are used for the major part of a home's hot water needs. With the Thermosyphon systems, the thermodynamics of hot water rising as cooler water sinks, requires a collector plate to be lower than the storage vessel. The storage tank is typically installed on a second story floor, or in or on the roof. This system must accommodate the additional weight of the water, and if installed in an active seismic zone, it must be made to withstand an earthquake. It must also be located so that it can effectively be serviced or the storage tank changed out. Thermosyphon systems are usually more expensive than the IPSWH systems. An "Active" Solar Water Heater makes use of mechanical devices such as pumps and fans. There are also two basic types of Active Solar Water Heater systems, the “Direct" circulation, and the "Indirect" circulation systems. The direct circulation system works very well in a no-freeze zone. Pumps circulate the household water through the collection plates directly. Both active and passive systems typically flow into a standard commercial water heater. Not so with the Indirect Circulation System. It is designed to circulate a non-freezing fluid such as glycol, hydrocarbon oil, or silicone. If using glycol, be sure to use the food grade propylene glycol rather than the very toxic ethylene glycol. This non-freeze heat transfer fluid is circulated through the solar collectors and a heat exchange unit that heats the household water. Obviously, this is the system of choice for climates that are subject to freezing temperatures. If you are planning to build and install your own solar hot water heater, find a good reputable solar system professional to help service your pumps, and size your heat exchanger. He can also help you find a heat transfer fluid that is compatible with the metals in the heat exchanger. And depending on your temperature zone, he can recommend the appropriate heat transfer fluid. Indirect Circulation systems are usually more efficient than the passive systems. The trade-off is initial expense, and additional maintenance. A solar water heating solution is not only affordable, it is also an environmentally sound way to reduce energy bills, and is the most cost effective way to reduce carbon emissions and reduce dependence on imported oil.